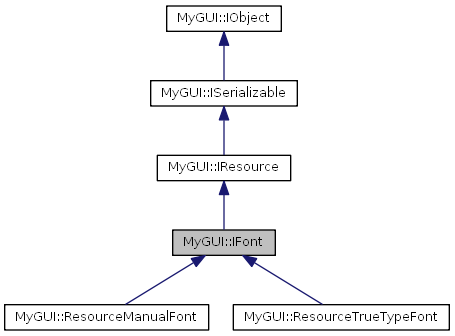 Definition at line 20 of file MyGUI_IFont.h. Definition at line 23 of file MyGUI_IFont.h. Definition at line 26 of file MyGUI_IFont.h. Definition at line 27 of file MyGUI_IFont.h. Implemented in MyGUI::ResourceTrueTypeFont, and MyGUI::ResourceManualFont. Reimplemented in MyGUI::ResourceTrueTypeFont, and MyGUI::ResourceManualFont.